VILNIUS, Lithuania (CNS) — Meeting young Lithuanians in Vilnius, Pope Francis said he wanted a relaxed conversation, like they were sitting in a pub drinking “a beer or a gira,” a slightly alcoholic beverage made from fermented rye bread. Yet the stories two young adults shared with him Sept. 22 and his responses to their concerns were not casual. Monika Midveryte spoke about growing up with an alcoholic father who beat her and eventually committed suicide. A young man, identified only as Jonas, spoke about being diagnosed with an autoimmune disease and how serious illness made him and his young wife realize just how serious their wedding vows were. Meeting the teens and young adults outside the city’s Cathedral of Sts. Stanislaus and Ladislaus, which has been destroyed and rebuilt several times, Pope Francis urged the two and all their peers to think about how God has been close to them, too, even amid tragedy. Before joining the young people, Pope Francis stopped at the “Gate of Dawn,” one of nine gates that led into the ancient city of Vilnius. The pope mingled with dozens of orphaned children and the families that have adopted or fostered them. After praying silently for several minutes before the oversized icon of Our Lady, Mother of Mercy that marks the gate, the pope gave a brief talk and then prayed a decade of the rosary with thousands of people gathered in the street. “When we close our hearts for fear of others, when we build walls and barricades,” the pope said, “we end up depriving ourselves of the Good News of Jesus, who shares in the history and the lives of others” and is present in their suffering. 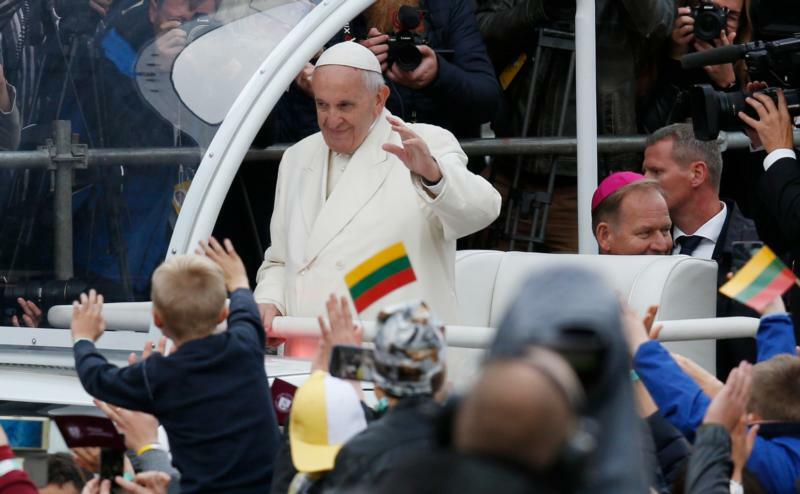 Vilnius was the first stop on Pope Francis’ Sept. 22-25 to Lithuania, Latvia and Estonia. The three Baltic nations are celebrating the 100th anniversary of their declarations of independence after World War I. While declared Soviet republics in 1940, the countries were occupied by the Nazis during World War II and then lived under Soviet rule from 1944 to 1990.